Last March I wrote about the plight of the Greater Sage Grouse in Canada, and plans by the group Ecojustice to take legal action, “seeking a court order to force Canada’s Environment Minister Peter Kent to recommend emergency protections for the iconic Prairie bird and the habitat it needs to survive in Canada.” Unfortunately, the federal government refused to act, claiming that the Minister of the Environment’s plans for protecting the Sage Grouse are part of a ‘Cabinet decision-making process’ and therefore confidential. Here is Ecojustice’s press release from this week. So the other month, on February 14, 2013, Ecojustice, representing the Alberta Wilderness Association, Wilderness Committee, Nature Saskatchewan, and Grasslands Naturalists, filed an application in federal court, that the Species at Risk Act (SARA), which mandates protection of endangered species and the habitat they need to survive and recover, should compel immediate action by the Minister and Environment Canada. The court order came after Ecojustice filed a petition last November demanding that Minister Kent use a provision in the federal Species at Risk Act to protect Canada’s remaining Sage Grouse, found only in Alberta and Saskatchewan. Signatories included the Alberta Wilderness Association, Biodiversity Conservation Alliance, the David Suzuki Foundation, Lethbridge Naturalists Society, Nature Alberta, Nature Saskatchewan, Nature Canada, National Audubon Society/Rockies, Sierra Club of Canada/Prairie Chapter, the Society of Grasslands Naturalists, WildEarth Guardians, and the Wilderness Committee. When Kent failed to move one way or another after 10 weeks [by January 16, 2013], [Ecojustice] requested a judicial review of what they called his refusal to carry out his responsibilities. They also asked for any materials Kent was using in his decision. Kent’s office refused to provide those documents. Nor has it offered anything beyond year-old statements saying the issue was, at that time, still under consideration. It won’t even say if a decision has been made. The government has argued that because Kent conferred with cabinet colleagues, the entire matter is covered by cabinet confidentiality. Alberta and Saskatchewan each have a provinicial Wildlife Act as well as voluntary guidelines for energy development near Sage Grouse habitat. However, provincial protections are so loose that Sage Grouse populations continue to decline. 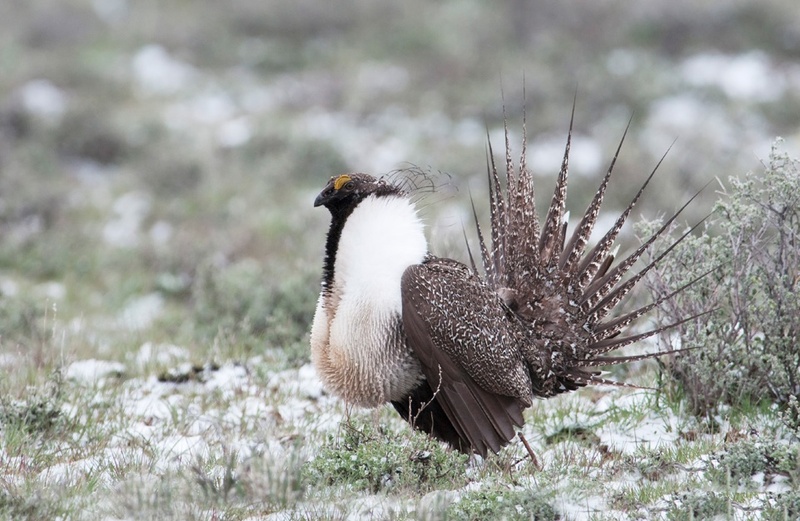 The environmental groups who joined to together last fall called on the oil and gas industry to voluntarily provide Sage Grouse with the protection they need. In Alberta, Sage Grouse can now be found only in the extreme southeast corner of the province, near Manyberries and Pakowki Lake. Ecojustice is a national charitable organization dedicated to defending Canadians’ right to a healthy environment. Founded in 1990 as the Sierra Legal Defence Fund with a team of two in Vancouver , Ecojustice changed its name in 2007 and is now a national organization with staff lawyers and scientists in Vancouver, Calgary, Toronto, and Ottawa. This entry was posted in Alberta Birds, Bird Conservation, Birding, Canada Birds, General Birding, Spring and tagged Ecojustice, Endangered Species, Greater Sage-Grouse, Species at Risk. Bookmark the permalink. It is very sad that the Government of Canada is unable to recognize that among this country’s natural resources its wildlife is equally important, in fact more important that its natural gas and oil. The world is switching from using these resources, as seen by the glut on the market and the panicked way the government is trying to sell them to anyone who would buy. There are other methods of energy, but NOT OTHER WILDLIFE SPECIES. It is shameful that Canada is busy extirpating not only the sage grouse but any other species that gets in the way of oil and gas removal from Canada’s ground and waters. Yes, many species are not getting the protection they need, and more has to be done to protect them. I have visited and birded the Manyberries area many times and know the area well. I have been there winter spring and summer and have noticed the developement of oil and facilities over the years. I believe the number of sage grouse is more than 40 but agree that the decreasing number of birds is a huge loss. There is still a vaste amount of habitat out there but there have also been conflicts between landowners and nature research folks that have not improved the situation at all. A good friend of mine from Medicine Hat who knows many landowners out there has been told by some to “keep away from my land in future”. Not a pleasant scenario is it? I hope that something can be done to save your Sage Grouse Charlotte, ours down here are in trouble too. Grassland grouse aren’t doing well in general and more has to be done to protect them.